Everyone has a memory to share with the family. In most cases because of the situation at hand, most of these memories are never shared or worse, never remembered. Now you can do something about it. 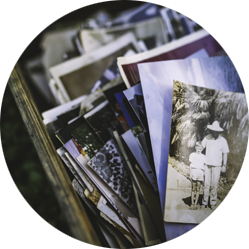 Some funeral homes offer a "memories" service of their own that are usually slips of paper for friends and family to fill out. These slips almost never make it to the family and if they do, are easily lost or thrown away. Plus it's impossible for the funeral home to offer this as a value-added service. Other digital options require that the funeral home purchase expensive hardware and software to be installed onsite. Memories of Us by Funeral Decisions enables friends and family to record memory videos directly from their smart phones...from anywhere in the world. Memories of Us also works with any DVD memorial software that you might use...Tukios, FrontRunner or anything else. Offer as a free value-added service to your tribute videos or better yet, create a whole new product to sell to families...regardless if they have a viewing or not.